An extraordinary island hub located at the tip of the Malay peninsula, Singapore treats the visitor to an eclectic and vibrant experience. A major business power, a cultural melting pot, a shopping mecca and garden city, it manages to pack a lot into a small island. And Singapore accommodation is well-geared for tourists. There are many options available, whether you're looking to stay on a budget or in five-star luxury. Meanwhile, cheap Singapore hotels are available in the heart of the town to put you close to the action. Famously a clean, well-ordered and maintained city, Singapore surprises with its diversity and possibilities. Home to five million people, it is a truly international community, with four official languages: English, Malay, Chinese and Tamil. This blend makes for an energising cultural scene and exploring the city's diverse ethnic neighbourhoods, such as Chinatown, Little India and Arab Street, is famously like travelling through several different countries in one day. Meanwhile, Singaporean food has enjoyed the benefit of all these influences and if you want to take in the breadth of the local cuisine, visit one of the hawker centres: open air complexes that sell a variety of inexpensive dishes. Singapore boasts many different attractions. The world-renowned Singapore zoo is a notable highlight, with its beautiful landscaping and naturalistic 'open' exhibits, while the city's lush tropical Botanic Gardens offers respite from the hustle of the city. Singapore's equatorial climate also makes the beach a good option and there are three good strips of sand on Sentosa, a small island just of the southern coast. Of course, shopping is a major part of the Singapore experience. The centrepiece of the island's retail is Orchard Road, a dazzling shopping paradise over two kilometres, comprising six department stores, 22 malls and almost 5,000 brands. Getting around in Singapore is easy thanks to superb public transport. The SMRT Railway System, extensive bus network and excellent road system means you have ready access to all attractions no matter which Singapore hotel you've based yourself at. 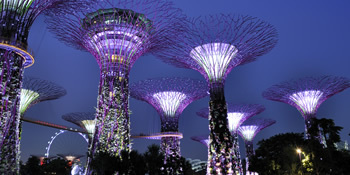 A fantastic holiday destination, Singapore rewards with a plethora of activities, sights and experiences. Slinging off to Singapore? Find your room today.